Fee Structure – Monson Wealth Management Inc.
Monson Wealth Management acts as a Fee-Only Fiduciary. What sets Monson Wealth Management, Inc from other investment advisor firms is our commitment to do just that with transparency and good sense. It isn’t fair to charge a 2-million-dollar client 4x the fees that we would charge a 500k client. Because there simply is not four times the work to do. It’s the same service model thus the same amount of service hours. Likewise, it is unfair to ask small accounts to pay large commissions and flat fees when they are just trying to build wealth and get going. At the same time, it isn’t fair for an advisor to not get compensated to service a small account for a beginning investor for little to no revenue. We believe that our fee structure is the fairest for all scenarios. This is important. It is a balance of offering our clients a fee program that doesn’t take too much of their hard-earned money all while we can grow as a business, provide top-notch service by recruiting and maintaining a talented team of professionals, obtain the best technology and resources at our disposal. Whether you want to travel more, do things you’ve always wanted to do, or just spend more time with the grandkids, we want to be your guide to help you get there. 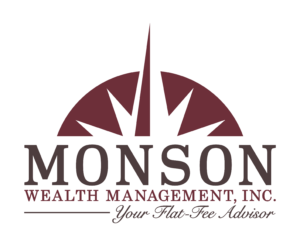 Monson Wealth Management is a registered investment adviser in the State of Washington and State of Oregon. The adviser may not transact business in states where it is not appropriately registered, excluded or exempted from registration. Insurance products and services are offered and sold through individually licensed and appointed agents in all appropriate jurisdictions.